This superb DVD gives absolute beginners the chance to learn basic rock drumming starting with simple beats and building up to fairly difficult four-way co-ordination. Learn a unique system of subdividing and phrasing, showing the student how to move around the kit using toms and cymbals, employing the now famous Drumsense teaching technique. 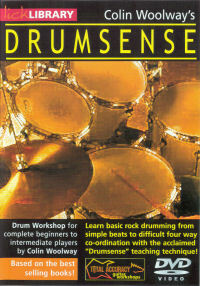 An absolute "must" for beginners or drummers who want to revise the basics of how the drumset works.